P2P Agri Farm business management resources for farmers and advisers. 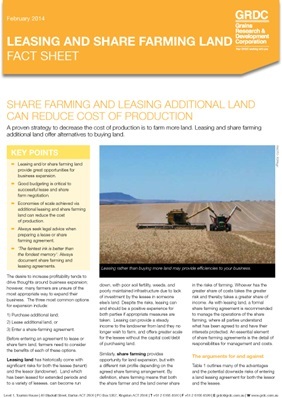 The Farming the Business manual P2PAgri produced for the Grains Research and Development Corporation (GRDC) has become a widely used resource at all levels in Australian agriculture – from farmers, to advisers and in education. It is currently used as a teaching in undergraduate farm business courses at universities and TAFEs around Australia. The manual is available as both a hard copy from GRDC and as an eBook available from iTunes Australia. Module 1: What do I need to know about business to manage my farm business successfully? The first module provides an overview of the business of farming, covering the economic environment, people management and the basics of sound farm business management. The aim of this section is to provide an overview to highlight areas to improve your farm business management skills. Module 2: Where is my farm business now and where do I want it to be? This module covers the ‘how to’ of sound farm business management. It goes through how to develop a business vision, the essential farm business budgets and financial and performance ratios. It provides detail on what financial reports should be generated so that you can have greater control of your farm business management and improve business sustainability. Module 3: How do I take my business to the next level? This module covers more advanced topics to extend and refine your farm business management. Some of the topics are risk management, succession planning and what analytical tools you should use to answer those important ‘what-if’ questions for scenario analysis. ‘Farming the Business’ is currently in its second reprint and is used by Melbourne University (Vic), Curtin University (WA), and Charles Sturt University (NSW). The following fact sheets were developed by P2PAgri for Grains Research and Development Corporation (GRDC) and are available from their website. Links are provided below. 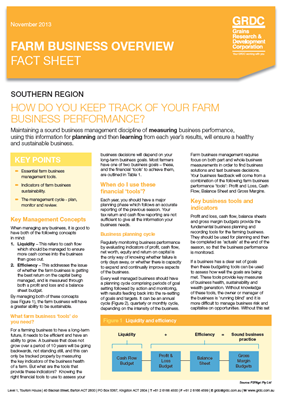 How do you keep track of your farm business performance? Maintaining a sound business management discipline of measuring business performance, using this information for planning and then learning from each year’s results, will ensure a healthy and sustainable business. How do I know if my farm business is viable? 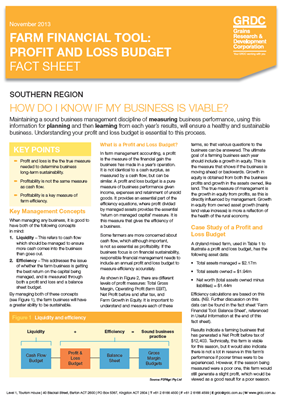 Maintaining a sound business management discipline of measuring business performance, using this information for planning and then learning from each year’s results, will ensure a healthy and sustainable business. 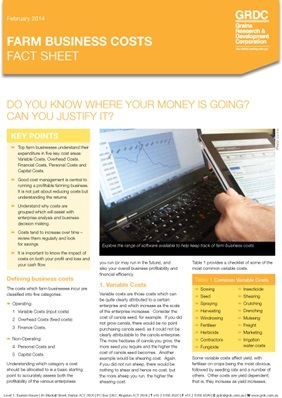 Understanding your profit and loss budget is essential to this process. Profit and loss is the true measure needed to determine business long-term sustainability. How do I know if my business has adequate funds? 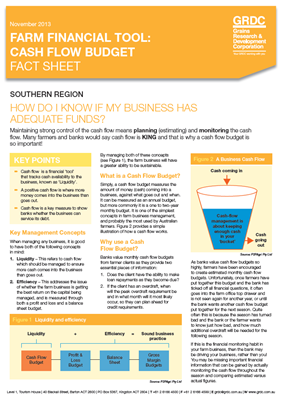 Cash flow is a financial ‘tool’ that tracks cash availability to the business, known as ‘Liquidity’. 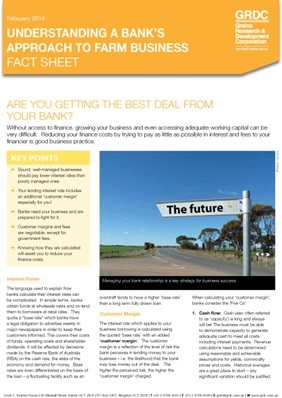 Cash flow is a key measure to show banks whether the business can service its debt. How secure is your farm business? 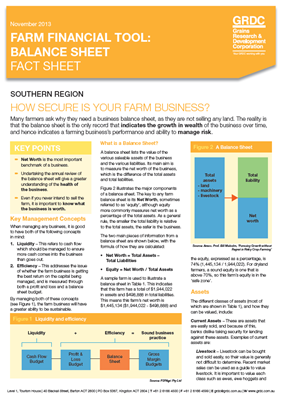 Many farmers ask why they need a business balance sheet, as they are not selling any land. The reality is that the balance sheet is the only record that indicates the growth in wealth of the business over time, and hence indicates a farming business’s performance and ability to manage risk. Many Australian farmers are involved in ‘multiple enterprise’ farming systems, which means the profits from each enterprise should be known. 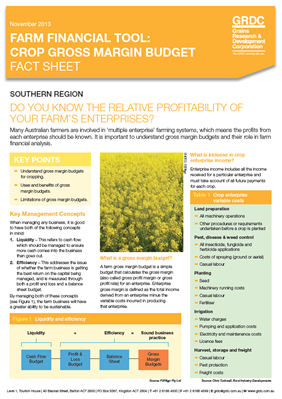 It is therefore important to understand gross margin budgets and their role in farm financial analysis. 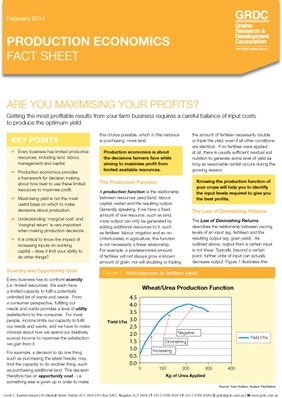 Are you maximising your farm business profits? Getting the most profitable results from your farm business requires a careful balance of input costs to produce the optimum yield. 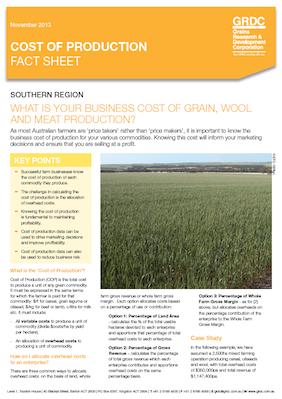 What is your business cost of grain, wool and meat production? As most Australian farmers are ‘price takers’ rather than ‘price makers’, it is important to know the business cost of production for your various commodities. Knowing this cost will inform your marketing decisions and ensure that you are selling at a profit. 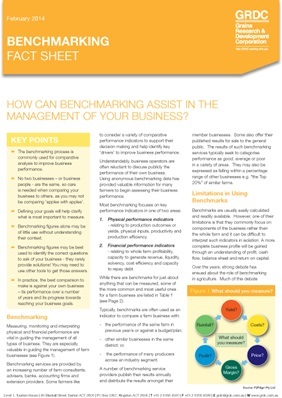 How much can benchmarking really tell you about your business? In practice, the best comparison to make is against your own business – its performance over a number of years and its progress towards reaching your business goals. 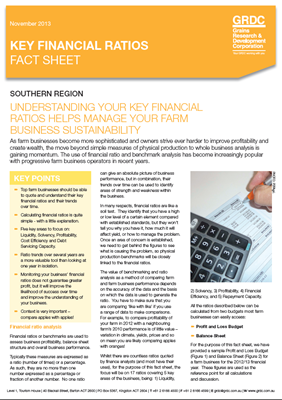 Understanding your key financial ratios helps manage your farm business sustainability. 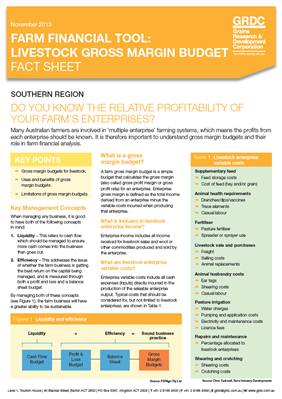 Top farm businesses should be able to quote and understand their key financial ratios and their trends over time. Ratio trends over several years are a more valuable tool than looking at one year in isolation. Monitoring your business’ financial ratios does not guarantee greater profit, but it will improve the likelihood of success over time and improve the understanding of your business. 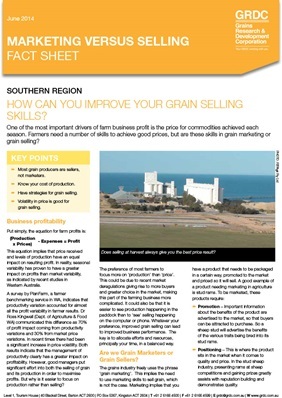 How can you improve your grain selling skills? One of the most important drivers of farm business profit is the price for commodities achieved each season. Farmers need a number of skills to achieve good prices, but are these skills in grain marketing or grain selling? Are you getting the best deal from your bank? Without access to finance, growing your business and even accessing adequate working capital can be very difficult. Reducing your finance costs by trying to pay as little as possible in interest and fees to your financier is good business practice. Do you know where your money is going? Can you justify it? Good cost management is central to running a profitable farming business. It is not just about reducing costs but understanding the returns. How much does your tax return tell you about your business? 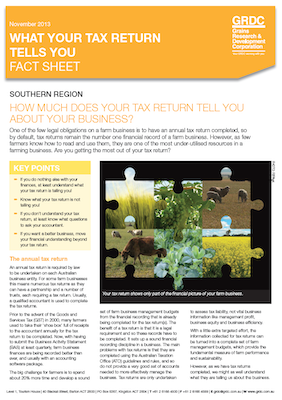 One of the few legal obligations on a farm business is to have an annual tax return completed, so by default, tax returns remain the number one financial record of a farm business. However, as few farmers know how to read and use them, they are one of the most under-utilised resources in a farming business. Are you getting the most out of your tax return? 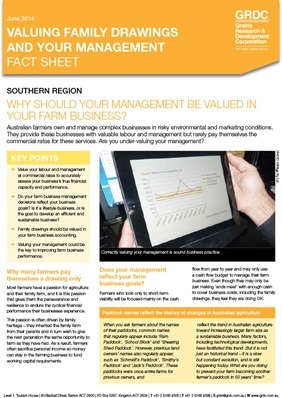 Why should your management be valued in your farm business? Australian farmers own and manage complex businesses in risky environmental and marketing conditions. They provide these businesses with valuable labour and management but rarely pay themselves the commercial rates for these services. Are you under-valuing your management?